William Thomas Riker was born in 2335 to Kyle and Betty Riker in Alaska on Earth. His distant ancestors were from mainland North America, including Colonel Thaddius Riker, who fought in the American Civil War. Betty died when Will was only two years old, leaving his father to raise him alone. The Rikers remained in Alaska at Betty's wish. The only thing which kept Kyle going was Will, but he did not feel as if he could discuss the situation with him, even when Will was older. The memories of Betty's presence at their Alaska home were also painful for both. This initial trauma created a rift between the two Rikers which lasted thirty years. When Will first started school, he told all of his new friends that his mother was still alive. Eventually, he told the story so often that he began to believe the lie. Soon, his teacher learned of this problem, and both she and Kyle had to talk to Will and make him realize that his mother was dead and was not coming back. Will cried the entire night following, but later realized it was an important step in accepting his mother's death. However, Will's relationship with Kyle continued to deteriorate into his early teens. He was often left to care for himself, learning such skills as cooking. Will was never able to concentrate much on subjects such as math, as he constantly daydreamed about starships. In 2344, Will and his father went on a fishing trip. Will was able to hook a large fish, but Kyle insisted on reeling the fish in. This incident bothered Will for many years. He also practiced anbo-jyutsu with his father. Kyle admitted that by the time Will was twelve, his skills were superior. Will did not know that the only reason he always lost was because his father used illegal hachidan kiritsu moves. Kyle completely abandoned Will by 2350, when Will was fifteen. Will held a grudge against his father for the following fifteen years. Will entered Starfleet Academy in 2353. During his time at the Academy, his superintendent was a Vulcan, who had taken the time to memorize the personnel files of each and every cadet. Paul Rice was a close friend of Riker's while at the Academy. He felt that people were out to get him during his first year at the Academy. During a battle simulation against a Tholian opponent, Riker calculated a sensory blind spot of the Tholian vessel and hid within the blind spot. This ingenious tactical strategy was noted in his record. Upon graduation in 2357, Riker was ranked eighth in his class. He set lofty goals for himself, and hoped to reach captain before thirty-five years of age. Seven months after graduation, Ensign William Riker's first posting was to the USS Pegasus under the command of Erik Pressman. He was the ship's conn officer, and his youthful appearance earned him the nickname "Ensign Babyface," coined by fellow crewmember Lieutenant Boylen. Phil Wallace was another of Riker's friends aboard the Pegasus. Fresh from the Academy, Riker was still somewhat serious about his work. Loyalty and obedience to his commanding officer were top priorities. Riker's ears were still ringing with words like Duty and Honor. This attitude caused him to behave against the principles of the Treaty of Algeron during a crisis on board the ship. Captain Pressman had been illegally testing a prototype phasing cloaking device aboard the Pegasus. This top-secret project was in violation of the Treaty of Algeron, not to mention extremely dangerous to the crew, leading most of the Pegasus officers, such as the first officer and chief engineer, to mutiny against Pressman. Riker was the only bridge officer to defend the captain, picking up a phaser and instigating a running firefight all the way to the escape pods. Only a few other crew joined Riker and Pressman. Once safely away, Riker and the others watched as the Pegasus apparently exploded, killing the remaining seventy-one personnel. Although Pressman commended Riker for his unquestioning loyalty, over the years Riker began to have doubts about whether he had made the right decision. The Starfleet Judge Advocate General investigated the Pegasus incident, but the survivors participated in a coverup. The Judge Advocate General discovered evidence of a mutiny aboard the Pegasus before its destruction. While further investigation was recommended, Starfleet Intelligence declared the entire incident classified and no followup was ever conducted. Following the Pegasus incident, Riker was stationed on Betazed. While there, he met Deanna Troi. The two began a relationship which lasted several years. Sometime during his early career, Riker needed to wear a feathered costume while on a diplomatic mission to Armus IX. Similarly, he wore furs to meet with the leadership council on Kabatris. 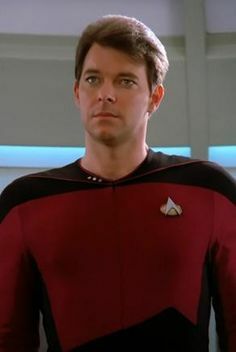 By 2361, Riker was promoted to lieutenant and assigned to the USS Potemkin. Aboard the Potemkin, he developed a tactic which involved using a planet's magnetic pole and shutting down all ship's systems to confuse an enemy vessel's sensors. Later in 2361, Riker led an away team to Nervala IV to rescue researchers stranded at the outpost on that world. Riker was the last to beam out. Atmospheric distortions threatened to dissipate his pattern, so the Potemkin transporter chief compensated by creating a second confinement beam. Only one beam was needed for Riker to rematerialize, so the second beam was shut down. The Potemkin crew did not realize that the second beam had, in fact, been reflected back to the planet's surface. In an odd twist of fate, the second transporter beam, which had exactly the same phase differential as the distortion field, maintained its integrity and created a duplicate William T. Riker. The duplicate Riker remained stranded on the surface for the next eight years. Up until that moment, both Rikers were the same person. As a result, both had an equal claim to being the "real " William T. Riker. Later, Riker received a promotion to lieutenant commander for "exceptional valor" during the mission. He was quickly posted to the USS Hood as first officer. Riker's commanding officer on the Hood was Captain Robert DeSoto. His service aboard the ship was exemplary, despite an incident where Riker refused to allow Captain DeSoto to transport into a hostile situation on planet Altair III. Riker was offered his first command, that of the ill-fated USS Drake, in 2364. However, he turned down that position for a far more enticing offer. William Riker was promoted to commander and first officer of the newly launched USS Enterprise-D in 2364. He was ferried to planet Deneb IV by the Hood, and met the Enterprise at the planet. The ship had undergone a saucer separation after being threatened by the entity known as Q. Riker reported aboard the stardrive section and was briefed about the current situation and was ordered to perform a difficult and unusual manual docking with the saucer module, which he conducted very well. During the Farpoint mission, Riker led several away teams which discovered that Farpoint Station was a living entity, trapped by the Bandi for their own selfish purposes. Riker was transported to a different quantum reality and into the year 2379 along with the Enterprise-D and all it's personnel. Riker took over as Acting Captain while Picard was off the ship filling in for Captain Janeway on the alternate Voyager.